This is a surname which is almost certainly of gaelic origins, but one in its present form which is almost wholly associated with the Isle of Man. Like most if not all surnames, which are in effect an anglicisation of a word from a former language, there is some disagreement as to its origin and meaning. There seem to be two or possibly three sources, the first being a form of'Cieather' a job descriptive word for a miller, whilst recent research suggests that it is a mutation of either 'Frere' (brother) or Mac yn Fhrir, the son of the Friar.As Friars were generally considered to be celebrate, this suggests a nickname, whilst 'Frere' is of course French, and may possibly be an import from that country shortly after the 1066 invasion of England. What is certain is that in its present form it has been recorded at least as far back as the begining of church registers in the Island in the early 17th century. These recordings include William Creer who married Jane Gellin at Braddan on January 1st 1685, the village of Braddan being the early epricentre of the name, and Christo Creer, parents unknown, christened at Malew on March 1st 1692.The first recording in London would seem to be that of Daniel Creer, at the church of St Leonards, Shoreditch, on July 25th 1767, and in Lancashire that of Catherine Creer, christened at St Nicholas Church, Liverpool, on November 13th 1796. 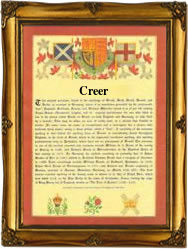 The first recorded spelling of the family name is shown to be that of Ann Creer, which was dated March 10th 1627, christened at Braddan, Isle of Man, during the reign of King Charles 1, known as 'The Martyr', 1625 - 1649. Surnames became necessary when governments introduced personal taxation. In England this was known as Poll Tax. Throughout the centuries, surnames in every country have continued to "develop" often leading to astonishing variants of the original spelling.